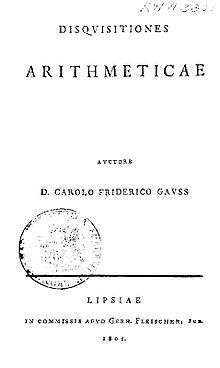 The Chinese remainder theorem appears in Gauss's 1801 book Disquisitiones Arithmeticae. The Chinese remainder theorem is a theorem of number theory, which states that, if one knows the remainders of the division of an integer n by several integers, then one can determine uniquely the remainder of the division of n by the product of these integers, under the condition that the divisors are pairwise coprime. This theorem has this name because it is a theorem about remainders, which was first discovered in the 3rd century AD by the Chinese mathematician Sunzi. The Chinese remainder theorem is widely used for computing with large integers, as it allows replacing a computation for which one knows a bound on the size of the result by several similar computations on small integers. The Chinese remainder theorem (expressed in terms of congruences) is true over every principal ideal domain. It has been generalized to any commutative ring, with a formulation involving ideals. Sun Tzu's work contains neither a proof nor a full algorithm. What amounts to an algorithm for solving this problem was described by Aryabhata (6th century). Special cases of the Chinese remainder theorem were also known to Brahmagupta (7th century), and appear in Fibonacci's Liber Abaci (1202). The result was later generalized with a complete solution called Dayanshu (大衍術) in Qin Jiushao's 1247 Mathematical Treatise in Nine Sections (數書九章, Shushu Jiuzhang). The notion of congruences was first introduced and used by Gauss in his Disquisitiones Arithmeticae of 1801. Gauss illustrates the Chinese remainder theorem on a problem involving calendars, namely, "to find the years that have a certain period number with respect to the solar and lunar cycle and the Roman indiction." Gauss introduces a procedure for solving the problem that had already been used by Euler but was in fact an ancient method that had appeared several times. Let n1, ..., nk be integers greater than 1, which are often called moduli or divisors. Let us denote by N the product of the ni. The Chinese remainder theorem asserts that if the ni are pairwise coprime, and if a1, ..., ak are integers such that 0 ≤ ai < ni for every i, then there is one and only one integer x, such that 0 ≤ x < N and the remainder of the Euclidean division of x by ni is ai for every i.
and any two such x are congruent modulo N.
between the ring of integers modulo N and the direct product of the rings of integers modulo the ni. This means that for doing a sequence of arithmetic operations in one may do the same computation independently in each and then get the result by applying the isomorphism (from the right to the left). This may be much faster than the direct computation if N and the number of operations are large. This is widely used, under the name multi-modular computation, for linear algebra over the integers or the rational numbers. The theorem can also be restated in the language of combinatorics as the fact that the infinite arithmetic progressions of integers form a Helly family. The existence and the uniqueness of the solution may be proved independently. However the first proof of existence, given below, uses the uniqueness. Suppose that x and y are both solutions to all the congruences. As x and y give the same remainder, when divided by ni, their difference x − y is a multiple of each ni. As the ni are pairwise coprime, their product N divides also x − y, and thus x and y are congruent modulo N. If x and y are supposed to be non negative and less than N (as in the first statement of the theorem), then their difference may be a multiple of N only if x = y.
maps congruence classes modulo N to sequences of congruence classes modulo ni. The proof of uniqueness shows that this map is injective. As the domain and the codomain of this map have the same number of elements, the map is also surjective, which proves the existence of the solution. This proof is very simple, but does not provide any direct way for computing a solution. Moreover, it cannot be generalized to other situations where the following proof can. Existence may be established by an explicit construction of x. This construction may be split in two steps, firstly by solving the problem in the case of two moduli, and the second one by extending this solution to the general case by induction on the number of moduli. The integers and may be computed by Extended Euclidean algorithm. This shows that The second congruence is proved similarly, by exchanging the indices. For constructing a solution, it is not necessary to make an induction on the number of moduli. However, such a direct construction involves more computation with large numbers, which makes it less efficient and less used. Nevertheless, Lagrange interpolation is a special case of this construction, applied to polynomials instead of integers. It is easy to check whether a value of x is a solution: it suffices to compute the remainder of the Euclidean division of x by each ni. Thus, to find the solution, it suffices to check successively the integers from 0 to N until finding the solution. Although very simple this method is very inefficient: for the simple example considered here, 40 integers (including 0) have to be checked for finding the solution 39. This is an exponential time algorithm, as the size of the input is, up to a constant factor, the number of digits of N, and the average number of operations is of the order of N.
Therefore, this method is rarely used, for hand-written computation as well on computers. Testing the values of these numbers modulo , and continuing until every modulus has been tested gives eventually the solution. 19 + 20 = 39 mod 3 → 0. OK, this is the result. This method works well for hand-written computation with a product of moduli that is not too big. However it is much slower than other methods, for very large products of moduli. Although dramatically faster than the systematic search, this method has also an exponential time complexity, and is therefore not used on computers. For more than two moduli, the method for two moduli allows the replacement of any two congruences by a single congruence modulo the product of the moduli. Iterating this process provides eventually the solution with a complexity, which is quadratic in the number of digits of the product of all moduli. This quadratic time complexity does not depend on the order in which the moduli are regrouped. One may regroup the two first moduli, then regrouping the resulting modulus with the next one, and so on. This is the strategy which is the easiest to implement, but it needs more computation involving large numbers. Another strategy consists in partitioning the moduli in pairs whose product have comparable sizes (as much as possible), applying parallely the method of two moduli to each pair, and iterating with a number of moduli approximatively divided by two. This method allows an easy parallelization of the algorithm. Also, if fast algorithms (that is algorithms working in quasilinear time) are used for the basic operations, this method provides an algorithm for the whole computation that works in quasilinear time. On the current example (which has only three moduli), both strategies are identical, and works as follows. The other solutions are obtained by adding any multiple of 3×4×5 = 60, and the smallest positive solution is −21 + 60 = 39.
where the unknown integers are and the Therefore, every general method for solving such systems may be used for finding the solution of Chinese remainder theorem, such as the reduction of the matrix of the system to Smith normal form or Hermite normal form. However, as usual when using a general algorithm for a more specific problem, this approach is less efficient than the method of the preceding section, based on a direct use of Bézout's identity. In § Theorem statement, the Chinese remainder theorem has been stated in three different ways: in terms of remainders, of congruences and of a ring isomorphism. The statement in terms of remainders does not apply, in general to principal ideal domains, as remainders are not defined in such rings. However, the two other version make sense over a principal ideal domain R: it suffices to replace "integer" by "element of the domain", and by R. These two versions of the theorem are true in this context, because the proofs (except for the first existence proof), are based on Euclid's lemma and Bézout's identity, which are true over every principal domain. However, in general, the theorem is only an existence theorem, and does not provide any way for computing the solution, unless if one has an algorithm for computing the coefficients of Bézout's identity. The statement in terms of remainders given in § Theorem statement cannot be generalized to any principal ideal domain, but its generalization to Euclidean domains is straightforward. The univariate polynomials over a field is the typical example of a Euclidean domain, which is not the integers. therefore, we state the theorem for the case of a ring of univariate domain over a field For getting the theorem for a general Euclidean domain, it suffices to replace the degree by the Euclidean function of the Euclidean domain. The Chinese remainder theorem for polynomials is thus: Let (the moduli) be, for i=1, ..., k, pairwise coprime polynomials in . Let be the degree of , and be the sum of the If are polynomials such that or for every i, then, there is one and only one polynomial , such that and the remainder of the Euclidean division of by is for every i. The construction of the solution may be done as in § Existence (constructive proof) or § Existence (direct proof). However, the latter construction may be simplified by using, as follows, partial fraction decomposition instead of extended Euclidean algorithm. Hermite interpolation is an application of Chinese remainder theorem for univariate polynomials, which may involve moduli of arbitrary degrees (Lagrange interpolation involves only moduli of degree one). The problem consists of finding a polynomial of the least possible degree, such that the polynomial and its first derivatives take given values at some fixed points. therefore is its Taylor polynomial of order at , that is, solves the initial Hermite interpolation problem. The Chinese remainder theorem asserts that there exists exactly one polynomial of degree less than the sum of the which satisfies these congruences. There are several ways for computing the solution One may use the method described at the beginning of § Over univariate polynomial rings and Euclidean domains. One may also use the constructions given in § Existence (constructive proof) or § Existence (direct proof). The Chinese remainder theorem can be generalized to any ring, by using coprime ideals (also called comaximal ideals). Two ideals I and J are coprime if there are elements and such that This relation plays the role of Bézout's identity in the proofs related to this generalization, which, otherwise are very similar. The generalization may be stated as follows. The Chinese remainder theorem has been used to construct a Gödel numbering for sequences, which is involved in the proof of Gödel's incompleteness theorems. The prime-factor FFT algorithm (also called Good-Thomas algorithm) uses the Chinese remainder theorem for reducing the computation of a fast Fourier transform of size to the computation of two fast Fourier transforms of smaller sizes and (providing that and are coprime). Most implementations of RSA use the Chinese remainder theorem during signing of HTTPS certificates and during decryption. The Chinese remainder theorem can also be used in secret sharing, which consists of distributing a set of shares among a group of people who, all together (but no one alone), can recover a certain secret from the given set of shares. Each of the shares is represented in a congruence, and the solution of the system of congruences using the Chinese remainder theorem is the secret to be recovered. Secret sharing using the Chinese remainder theorem uses, along with the Chinese remainder theorem, special sequences of integers that guarantee the impossibility of recovering the secret from a set of shares with less than a certain cardinality. The range ambiguity resolution techniques used with medium pulse repetition frequency radar can be seen as a special case of the Chinese remainder theorem. must be equal to the family (0)i∈I. Next, for i, j ∈ I; i ≠ j the two k-linear maps Fi : k[M] → k and Fj : k[M] → k are not proportional to each other. Otherwise fi and fj would also be proportional, and thus equal since as monoid homomorphisms they satisfy: fi (1) = 1 = fj (1), which contradicts the assumption that they are distinct. Consequently, (αi)i∈I = (0)i∈I. QED. ↑ Joseph B. Dence, Thomas P. Dence. "Elements of the Theory of Numbers". Retrieved 28 August 2016. Duchet, Pierre (1995), "Hypergraphs", in Graham, R. L.; Grötschel, M.; Lovász, L., Handbook of combinatorics, Vol. 1, 2, Amsterdam: Elsevier, pp. 381–432, MR 1373663 . See in particular Section 2.5, "Helly Property", pp. 393–394. Cormen, Thomas H.; Leiserson, Charles E.; Rivest, Ronald L.; Stein, Clifford (2001), Introduction to Algorithms (Second ed. ), MIT Press and McGraw-Hill, ISBN 0-262-03293-7 . See Section 31.5: The Chinese remainder theorem, pp. 873–876. Knuth, Donald (1997), The Art of Computer Programming, Volume 2: Seminumerical Algorithms (Third ed. ), Addison-Wesley, ISBN 0-201-89684-2 . See Section 4.3.2 (pp. 286–291), exercise 4.6.2–3 (page 456). Weisstein, Eric W. "Chinese Remainder Theorem". MathWorld.